Dragon Sword Canes for sale are 35 inches in all. 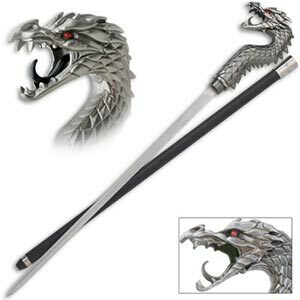 These popular cane swords have a highly detailed dragon with red piercing eyes as the handle and a steel sword blade. The 15 ½ inch stainless steel blade features a beveled edge and is removed from the cane shaft by twisting the head of the dragon. The bottom of the black aluminum cane shaft has a rubber foot or ferrule. Buy these popular Dragon Sword Canes for $39.99.